of the slanting sky at dusk. in the heart of Dream two. as they slumbered after making love. to wipe away the specks of light. Dream one is a woman. Dream two is a man. Dream two smelled blood and yelled. That will never get filled, I swear. Now, you kiss the cup. des schrägen Himmels beim Einbruch der Dunkelheit. im Herzen von Traum Zwei. während sie schlummerten nach dem Liebesakt. um die Flecken der Nacht wegzuwischen. Traum Eins ist eine Frau. Traum Zwei ist ein Mann. Traum Zwei roch Blut und schrie's heraus. die aufgedunsen waren, von 'runtergewürgter Monotonie. der nie voll werden wird, das schwöre ich. Jetzt - küsst du den Becher. Du kletterst die Leiter hinauf. Ashitha.M. lives in Bengaluru and writes in Malayalam and English. 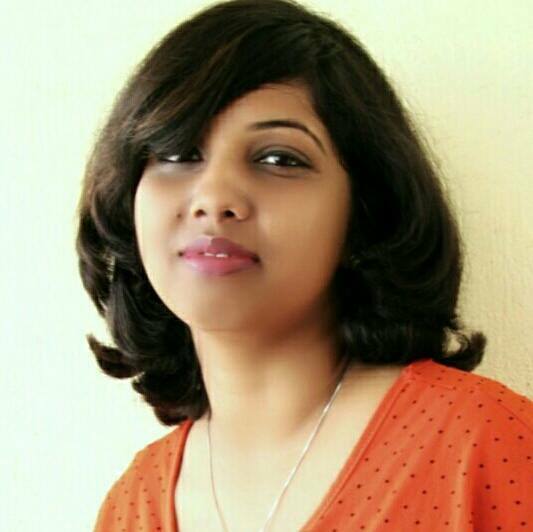 As a chief copy editor with the Times of India newspaper, she edits real life stories to make a living; writes poems and short stories to connect with the inner self. Her first collection of short stories 'Jennifarum Poochakkannukalum' came out in 2009. (Winner of Kairali-Atlas award). Her poems and stories have been published in magazines like Samakalika Malayalam, Madhyamam, Kala Kaumudi, Malappuram Voice etc.